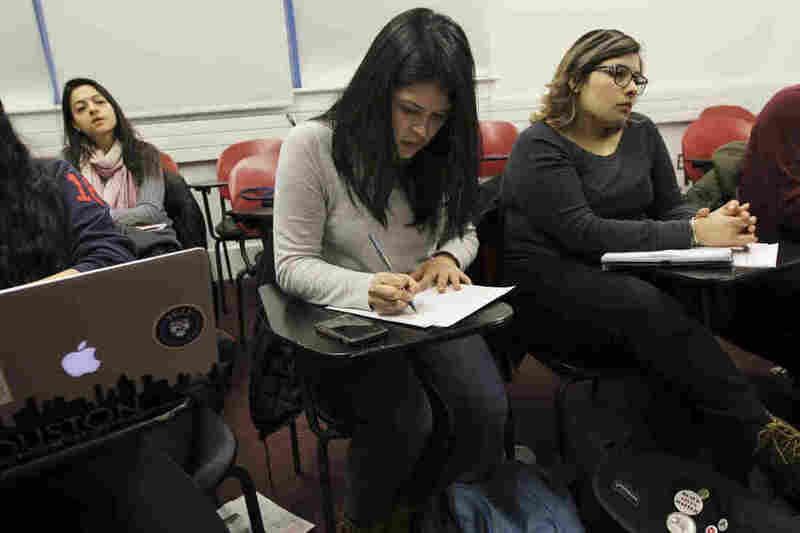 Amid Trump's Immigration Crackdown, Students Worry About Their Future : NPR Ed More than 750,000 young people have registered under the Deferred Action for Childhood Arrivals program. 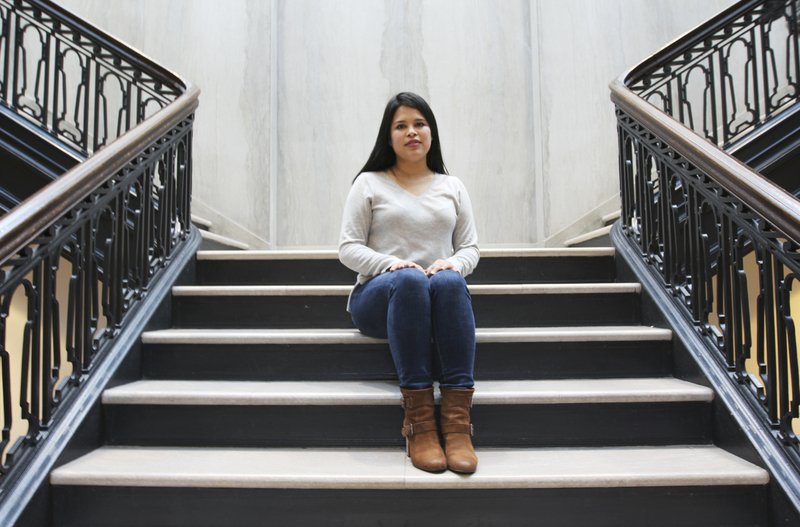 Many, like college senior Daisy Romero, worry about their future in the U.S.
Daisy Romero, a political science senior at the University of Pennsylvania, is registered under DACA and worries about her future. It's been nearly five years since president Barack Obama signed the executive order known as DACA, Deferred Action for Childhood Arrivals. It gave "protected status" to immigrants who had arrived in the U.S. before they turned 16. DACA allowed them to remain in the U.S., work, obtain a driver's license and study. More than 750,000 registered and were vetted. DACA, however, did not offer them a pathway to citizenship. It just meant they would not be deported. During his presidential campaign, Donald J. Trump called DACA "illegal" and a violation of the constitution. As president, Trump has since softened his tone, but many young people protected under DACA are still fearful they'll be rounded up and deported. Daisy Romero, 21, is one of them. She's a political science major at Trump's alma mater, the University of Pennsylvania. Born in Coahuila, Mexico, Romero grew up in San Antonio, Texas. She was 9 years old when she and her parents entered the U.S. with tourist visas. They never went back. Daisy Romero takes notes in class. Why didn't your parents return to Mexico after their visas expired? My dad had lost his job as a supervisor at a factory that made gas tanks. It shut down and let everybody go. We decided to stay in San Antonio. My parents didn't tell us what was going on until they bought us uniforms for school. I remember my sister and I didn't want to stay in San Antonio. My friends were all back in [Mexico]. When did you register for DACA? I remember exactly. The date was Oct. 15, 2012. I was working part-time and had even thought of dropping out of high school to help my family. People at my school knew of my status so they were really happy when DACA went into effect. We all thought it was going to be a solution. Did you physically show up at a U.S. Immigration office in San Antonio to apply for DACA? No. We began talking to a small organization, I don't remember its name. They explained DACA to us. There was an application in which we had to show that we had been in the U.S. continuously for a certain number of years. There were questions about my moral character. They asked me to provide letters of support and to list the awards I had received. You know, school-related awards. I had some in math and science and I was in the National Honor Society. When you registered for DACA you had to disclose a lot of personal information about your parents, too. This must have put them at risk of being deported. I know. They're still thinking about how this can hurt us. But at the time, I never thought that anybody would use the information against us. That's why I was hopeful. The University of Pennsylvania actually has a history of enrolling undocumented students since before DACA. Today, it's one of at least 33 institutions nationwide that have declared themselves "sanctuary campuses." That means they won't cooperate with U.S. Immigration or law enforcement agents in identifying or arresting undocumented students. But what about students registered under DACA, like you? The government already knows where I am. Immigration agents are not going to come looking for undocumented students on campus. I may even be safer because there's a community of people supporting me. I have the support of many faculty members and the administration is siding with us, showing support. It surprises and angers people that there are undocumented students here on campus. There was an article about me in the student newspaper with a photo of me smiling and that triggered some anger in the comments section. My parents warned me that I would be a very loved person but also a very hated person. I don't think about it either way. You and a group of undocumented students drafted a petition asking school officials to protect you from deportation if DACA is phased out. But don't you think the university is taking some risks by defying U.S. immigration law? Have you talked to an immigration attorney about your personal situation? I haven't yet. The solution for me would be to get married [to a U.S. citizen]. There's no other way. You say you're most worried for your parents. You told me earlier that, when you were back home in San Antonio for winter break, your father was pulled over by local police for a broken tail light. He didn't have a driver's license. [Daisy adds that she says the police officer let her father go.] After all my family has been through, we've been lucky.